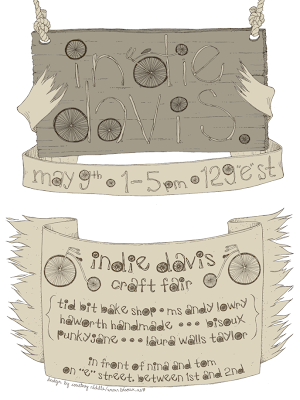 To celebrate Mother’s Day and the tradition of hand-made goods, nina and tom announce the launch of Indie Davis this Saturday May 9, 2009 1-5 p.m. in front of their brick and mortar store at 129 E Street Suite B-1 in Davis. 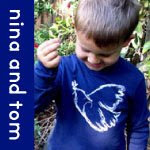 nina and tom will be showcasing the talents of local crafters who hand produce original, one of a kind gifts that will sure to please any mom or special someone. During this time of economic uncertainty and environmental crisis, there is no better time to support our local economy and lessen our carbon footprint by purchasing goods made from where we live. Come visit Downtown Davis and see what you can find. Tid Bit Bake Shop- Yummy and lovely cupcakes using only the best ingredients and care. Punky Jane Jewlery- Specializing in hand stamped, custom sterling silver jewelry, as well as, her original stock designs ready to wear that make the perfect gift for just about anyone. Bisoux-A sweet & eccentric mix of feather hair clips, knitted animals and fashion goodies. Haworth Handmade – Natural materials including wood for pendants and rings and felted stones, along with Mark Duede’s nature photography. Laura Walls Taylor Modern Ceramics- Delightful and functional ceramics -- all hand made and hand painted. Bowls, vases and plates along with mug riders, critters and fun dishes. All perfect for Mother’s Day. Why Girls Go Astray- With a love for working with paper and textiles, Ms. Andy produces paperweights, "ice cube" magnets, and decoupage vases that have bold colors and retro images with a dash of camp.